Malmö University was founded in 1998. 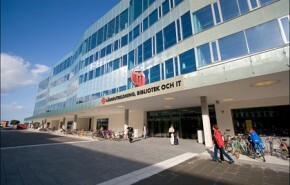 Located in the centre of Malmö at Universitetsholmen, the university has played a central role in the transformation of Malmö from industrial town to centre of learning. Malmö University strives to be a university open to all; a university that is structured to cope with an ever-changing jobs market through a multi-disciplinary approach that crosses traditional school and faculty boundaries. In total, Malmö University has more than 90 separate education programmes and 500 courses. It teaches 18 Bachelor and Masters programmes through English. At present, almost 1800 international students are enrolled at the university. Malmö is located in Southern Sweden, close to Denmark – Copenhagen is only an hour away – and with easy access to mainland Europe. With a population of 300,000, the third largest city in Sweden, Malmö is both a charming town and the vibrant metropolitan city . A compact and well-planned city, everything is just a short stroll or bike ride away. As a coastal city with green parks and lush areas and a pulsating downtown area, Malmö really has something for everyone. Students love Möllan, where you they find an international mix of grocery stores, fresh food markets, restaurants and an eclectic nightlife. Ribersborg, the city’s own 1.5-mile-long beach with boardwalk, bike trails and sand dunes, is a favorite destination of people from near and far.